Figure from Lewis (2010) with annotation added. Using data from satellites, the red-blue maps compare the rainfall in the dry seasons of 2005 and 2010. The "maximum climatological surface water deficit" (MCWD) is a factor that more accurately predicts the amount of stress that the trees endure in a drought and is shown in the lower, brown-colored couple of maps. The zones with the most severe expected drought damage are highlighted by green circles, added here to the original published figure. There was a dry zone observed in both droughts in the southwest of the Amazon basin. The 2010 drought affected two additional affected areas, one in the south of the Basin, in Northern Bolivia and another in the southeast, in Mato Grosso State, Brazil. Droughts reduce the rate of tree growth and repeated droughts may cause trees to die off altogether. Forest fires are also more likely during unusually dry periods and in 2010 extensive fires were reported in Northern Bolivia . All these effects combine to make the Amazon basin in 2010 into a source of carbon rather than a net sink Simon Lewis and his co-workers calculated that the impact of the 2010 drought amounted to an effective net transfer of 2.2 gigatonnes (billion tonnes) of carbon from the biomass to the atmosphere. To put this into perspective, 2.2 gigatonnes is comparable to the emissions resulting from fuel burning in 2008 from India and China combined, according to the IEA. One dry year in the Amazon, therefore, may have made as big a contribution to greenhouse gasses as the annual contribution of the two largest developing economies. Last year, the lungs of the world were breathing out carbon when we would have preferred them to be breathing it in. Droughts in the Amazon tend to occur at the same time as sea surface temperature anomalies in the Pacific (El Niño) and in the Atlantic Oceans. Climate models predict an increase in the frequency and severity of both ocean temperature anomalies and droughts in the Amazon. On the other hand, the two exceptional droughts that occurred in quick succession might just represent unusual weather years and, if there were a return to normal rainfall patterns, the forests might recover quickly. But if the climate model predictions are correct, we should expect additional severe Amazon Basin droughts over the coming decades. One of the slow positive feedbacks to climate change--the great Amazonian forests starting to emit, rather than continuing to absorb carbon--may be kicking in more quickly than we previously feared (for example, see Cox et al 2000}. The BBC has produced an excellent short video report on this story. I have never understood how the forest can be a carbon sink. In a stable world the amount of carbon in the forest would be constant, with carbon absorbed by growing trees balanced by carbon released by dead trees as they rot. If the whole area was once forest then the best you can hope for is that the forest remains carbon-neutral; it cannot be a carbon sink unless it increases in size, which is nor going to happen in the foreseeable future. So how id all those coal deposits form then? I thought that they were the compressed remains of dead forests. I'm no expert but this is my take on this. Hopefully, others will contribute also. Part of the increasing amounts of CO2 emmitted by humans by the burning fossil fuels is absorbed by forests. It is true that the forests release CO2 as a result of rotting vegetation but most of it is stored as humus and in roots systems within the soil. Even the ashes resulting from bushfires do not convert back to CO2 without a significant time lag. Coal takes too long to form to be of any use in helping to store part of the anthropogenic CO2 formed over the past few decades. I need a new word for the feeling this kind of story gives me. It encompasses a vertigo-like sense of "oh my Christ, this is really actually happening on the one and only planet we have" and "yet there are people willing to ignore it or argue it's not happening for their own psychological convenience, votes or just plain money." It makes the pit of my stomach fall right through to my feet. Think I need to go for a brisk walk! I think there's a misunderstanding of what a "sink" does. My understanding is that a stable forest won't remove CO2 from the atmosphere (as BillyJoe points out, certainly not on a short term basis). It's just that if the forests go then the stable carbon that was locked up the (considerable) biomass will enter the atmosphere as more CO2. That is the essence of denialism. Denialists like to proclaim that they are being likened to Holocaust Deniers. But it is they who raise this supposed connection. #5: "My understanding is that a stable forest won't remove CO2 from the atmosphere"
Measurements of carbon dioxide flux over undisturbed tropical rain forest in Brazil for 55 days in the wet and dry seasons of 1992 to 1993 show that this ecosystem is a net absorber of carbon dioxide. Photosynthetic gains of carbon dioxide exceeded respiratory losses irrespective of the season. ... carbon-cycle feedbacks could significantly accelerate climate change over the twenty-first century. We find that under a 'business as usual' scenario, the terrestrial biosphere acts as an overall carbon sink until about 2050, but turns into a source thereafter. Nice post Andy, interesting (and somewhat concerning) paper. Dan: I know what you mean about your personal reaction to this kind of news. I've been studying energy and climate issues non-stop for the last 7+ years, and I still experience that reaction from time to time. including when I read about this Amazon finding. Almost any news about permafrost or methane hydrates puts me in the same place -- there's been a lot of "it's worse than we thought" news on those fronts in the last couple of years. I also struggle with the idea that the Amazon is a net carbon sink over any appreciable time frame. In a way it seems like the notion of the ocean absorbing a lot of the extra heat from CC -- sure, it's a great benefit in the short run, but that heat is going to resurface (literally) eventually, and then we'll have to contend with it plus the additional heat accumulation. Umm it's not going to make Dan or Lou feel any better though -- sorry about that. Also see figure 7, the spatial variation of drying trends, which shows some drying trend in the Amazon, but not ubiquitous or as much as other locations. The 2010 event described above is partly due to the trend and partly to weather (ENSO and other factors). Another paper shows a drying trend in the Amazon since the 70's http://journals.ametsoc.org/doi/pdf/10.1175/JHM-386.1 in figure 5 but also evidence of cycles. #11: "The 2010 event described above is partly due to the trend and partly to weather"
One could conclude that by taking 2010 in isolation. Unfortunately, as Andy S points out in the post, the prior drought was 2002-2005 - and that was "supposed to have been a one-in-a-hundred-year event." A mere five years later, "last year's drought was both more severe and more extensive than the earlier one." Two 'hundred year events' in 5 years is highly exceptional. The 2005 drought in the Amazon was particularly severe in the western and southern parts of the basin where many rivers and lakes had lowest water level in many decades. ... In the public media, this drought has been linked to climate change, deforestation, and an anomalously warm North Atlantic Ocean that was thought to also have contributed to an energetic hurricane season. The 2005 drought in the southern Amazon appears to be mostly caused by Atlantic SST anomalies. ... some of the spring North Atlantic warming may be partly caused by El Nino which peaks in Boreal winter, and thus exacerbating the direct El Nino drought in the Amazon. Nonetheless, Atlantic warming is also often not related to El Nino, and severe drought in the Amazon is more likely when they happen either near-simultaneously (such as 1997-98) or sequentially (such as during 2002-2005). Sorry, I don't think we're making anyone feel better. Phillips et al (2009) report that measurements made since 1980 indicate that Amazonia has absorbed about 1.8 Gt of CO2 annually. This changed abruptly in 2005 and it looks like it has taken another dive in 2010. The productivity of the Amazon forest seems to have been increasing up to 2005. I'm not sure exactly why but I'm guessing that rising CO2 concentrations may have played a role before 2005, when a lack of rainfall turned the trend around. An article by Tans (2009) contains an interesting plot, shown below. Since 1935, the terrestrial biosphere has been acting as a carbon sink, Some of this sequestration has been taking place in Amazonia, at least for part of this time, but the majority of the sink is probably happening in high northern latitudes, through reforestation and increased plant growth in the tundra. This continuing negative feedback may make us feel better but our sense of relief may be short lived if factors like forest fires, melting permafrost or pine beetles start to play a bigger role. Eric @ 11 - The 2005 & 2010 droughts were driven by warmer than normal sea surface temperatures in the tropical Atlantic. Hence the large coral bleaching events in the Caribbean in both those years too. The too warm SST's in the tropical Atlantic drives the ITCZ further northwest over the Northern Hemisphere summer. The result is the "rain-making engine" moves out of the Amazon, exaggerating the effect of the dry season. El-Nino causes drought in the Amazon by shifting the convective area over to the eastern tropical Pacific Ocean, where the SST's along the South American coast are ramping up. Once again the rain-making shifts toward the area of greater sea surface temperatures. 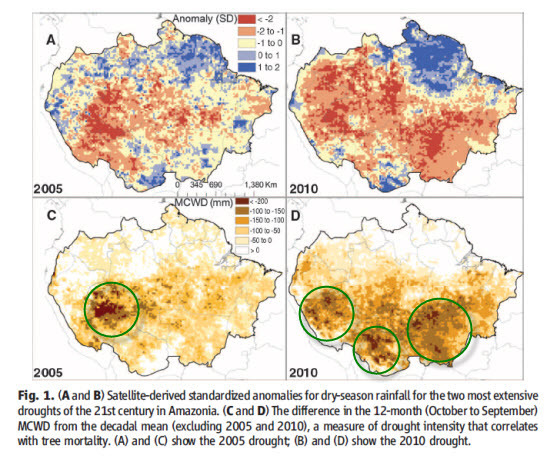 The connection between drought/wet episodes in the Amazon are very consistent throughout the 20th century. 16 out 17 El- Nino caused drought, and 14 out of 16 La Nina caused wet episodes in the Amazon. See Ropelewski & Halpert 1987. The figure jumps higher when the 1990's Amazonian droughts are included. The prevailing view is that the increased growth is down to the CO2 fertilization effect, although it has not been proven. Another hypothesis is that the increase in sunlight (cloud cover has reduced in the last few decades) may have also helped to increase growth. See Arias 2010 - Changes in Cloudiness over the Amazon rainforests during the last two decades. Because of the persistent cloud cover over the Amazon, green-up (a spurt in plant growth) can occur during the early stages of a dry period. Assuming of course, there is sufficient ground water available to the plants. Obviously in 2005 & 2010 there wasn't enough water. Also, I wonder how much organic material is washed out to sea from the Amazon. Of course, any number of things could happen to it at that point, but I think it would be fair to say that a rain forest absorbs more CO2 than, let's say, a savanna. So in 2010 the amazon released more co2 emissions then China and India put together. So if this becomes once every 5 years instead of 100 or 200 year event then it may speed up the green house effect and make it far harder for us humans to do anything about it. A run away feed back. #12 muoncounter, is there a trend in "100 year events": how are they defined and what is the trend of those events? Or is drought length increasing? There seems to be just one longer drought in 2005 so far. Also while there are currently longer N. American droughts http://www.agu.org/pubs/crossref/2007/2007GL031764.shtml that paper indicates that longer droughts have occurred in the past. but we'll probably find out in the next 5 years or so if we start getting large El Ninos contrary to the diminished El Ninos that we would expect from a natural cycle. #4 Dan. I know that sinking feeling, only this is worse. It looks as though the Amazon is declining (or reacting or whatever) at the same kind of much faster than expected rate as Arctic ice. I've acquired a bit of fascination and interest with the ice statistics and a couple of lively blogs. The excitement and the learning tends to keep the omg feeling at bay. But this is just plain, everyday, unadorned awful. Moderator Response: [Daniel Bailey] I had the same reaction when I read this. #18: "a trend in "100 year events": how are they defined"
Hundred year events are specifically defined as those events with a 1 in 100 probability of occurrence in any given year. Methods for calculating that statistic have been around since the days of Gumbel graphs. The Zeng paper I referenced here specifically states Amazon droughts are better correlated with Atlantic SSTs. Really, you've can't blame it all on el Nino. The paper you referenced here has a fascinating map depicting how the Palmer Drought Severity Index (PDSI) changed during the periods 1900-1949 and 1950-2002. Maps of linear trends of PDSI [change (50 yr), calculated with both precipitation and temperature changes] during (top) 1900–49 and (middle) 1950–2002. (bottom) The trends of PDSI calculated without temperature changes. Red (blue) areas indicate drying (wetting). The more recent 50 years sure look more severe than the prior 50. The graph ends in 2002, the beginning of the most recent 100 year events in the Amazon. Our PDSI results, which are based on atmospheric moisture supply and demand near the surface, are consistent with increased evaporation under greenhouse gas–induced warming, as predicted by comprehensive coupled climate models. Global temperature increases have become pronounced after the 1970s and have been attributed to human-induced climate changes arising primarily from increased greenhouse gases. This is a good example of why, when the youthful optimists among the Caltech alumni dream of geo-engineering solutions to global warming, I always remind them: "it is too late, we have missed our chance to avoid a huge surge in war, pestilence and famine due to AGW". But what this latest news shows is that even cockroaches are going to have trouble surviving. muoncounter, I'm glad you liked the paper. I liked the first paper also which more properly (IMO) attributes the droughts to both AGW and ENSO (my theory is above). Here's the most severe Amazon drought of the 20th century http://www.scielo.br/pdf/aa/v35n2/v35n2a13.pdf caused by the 1925-1926 El Nino http://www.meteohistory.org/2004proceedings1.1/pdfs/07cushman.pdf The record low last October of 13.63 meters is in line with previous droughts. The 2009 maximum (see graph in the paper) was 29.71 meters, an extreme in the other direction. I don't have data for the 2010 maximum but it is likely well above the 1926 maximum. I should have said: the 2009 maximum is not on the graph in the paper, but it can be put in context using the graph in figure 3. Even without extreme temperature change, the disappearance of humans from the environment, for whatever reason, will have drastic effects on cockroaches. Cockroaches, like rats, are commensal with humans. They eat our waste food. We're the ones who have made their populations explode and niches expand unnaturally. Eric (skeptic) - as far as 2005 & 2010 Amazonian drought are concerned, they are unrelated to ENSO (El Nino). They arise from the warm sea surface temperatures in the tropical Atlantic. From your comments thus far, it's not clear you have understood this. "El Niño causes anomalously low precipitation in the catchment that results in a significantly lower water discharge of the Amazon River and consequently in an extension of the vegetation period. In those years tree rings are significantly wider. Thus the tree-ring record can be considered as a robust indicator reflecting the mean climate conditions of the whole Western Amazon basin. We present a more than 200-year long chronology, which is the first ENSO-sensitive dendroclimatic proxy of the Amazon basin and permits the dating of preinstrumental El Niño events. Time series analyses of our data indicate that during the last two centuries the severity of El Niño increased significantly. Rob Painting, I think that is an oversimplification. Reading through the Zeng paper (link in 20) I noticed that Zeng cannot separate the Atlantic warming from ENSO. It is certainly no coincidence that El Nino was present in 2005 and 2010. But it is true that ENSO is not the only factor involved. It is also true that El Nino does not always cause Amazon drought, but it is correlated along with La Nina and more rain in the Amazon. 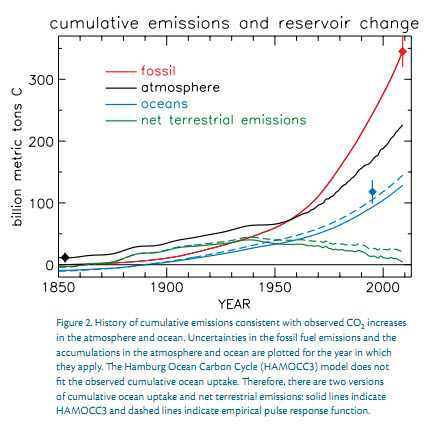 Also, I think our interpretations of "...we cannot attribute the recent ENSO shift..." might be different. I think they mean that their research was on how the shift in SST patterns affect rainfall over land patterns, and not directly on the causes of the SST changes. The research of others that they read was ambiguous on the matter; so, they are simply stating that they are not taking a stand on that aspect. I get the impression that you think they mean something more like, "..recent ENSO shifts can not be attributed...", which would be something else entirely. In any case, we know humans are changing the thermodynamic properties of the earth, and ENSO, winds, and rainfall are just means of distributing energy within the earth system. So, it would be silly to think that we aren't changing the pattern of when, where, and how much it rains. This study of the Amazon is just a quantification of the symptoms to date. "In 2005, both ENSO and SATL (tropical South Atlantic) are weak but a warming North Atlantic led to the drought." The main point from the Zeng paper, was that the 2005 drought was made worse by the drying induced in the preceding years (2002-2004) by El-Nino. They also point out that Amazonian drought is amplified if the warm sea surface temperatures occur in both the Eastern Pacific and tropical Atlantic at the same time, or as in 2002-2005 in sequence. Not 100% of the time, but the correlation is very robust. Seems to me that you are looking for reasons to not accept the finding of dozens of peer-reviewed studies on this topic. Chris, I think it is too soon to tell if there is a trend in El Ninos getting stronger or more numerous. There seemed to be one in the 90's (minus Pinatubo) but that quieted down. Rob, I never doubted the strength of the correlation between El Nino and drought. That is simple causation as explained in the head post. Also I don't doubt that AGW will exacerbate the drought in some cases, specifically when Atlantic warming coincides with El Nino. Here's a paper http://www.springerlink.com/content/8415720180780275//fulltext.html that quantifies North Atlantic warming trends to supplement the Zeng paper. Their conclusion is 0.03 C per decade. WRT to CC, I like the phrase: "we may even see new ‘flavours’ of ENSO emerge as we move into the future” --Julia Cole, a climate scientist at the Institute of the Environment at the University of Arizona. BBC link doesn't work for me. There is no video on that page nor link to it that I can see.